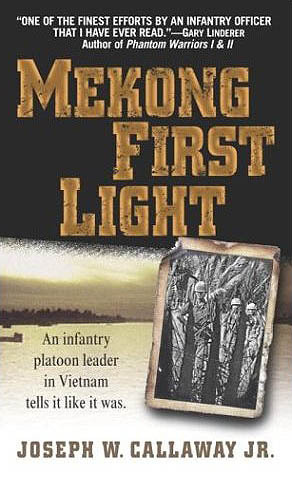 “Mekong First Light” – Lt. Joseph W. Callaway Jr.
By Lt. Joseph W. Callaway Jr.
JOSEPH W. CALLAWAY, Jr. grew up in Enterprise, Alabama, and New Canaan, Connecticut. He entered the army as a private in 1965 and, after being commissioned as an officer through Infantry OCS (Officer Candidate School), served in Vietnam from December 1966 until July 1968 as an infantry platoon leader with the 9th Division, a combat advisor to the first Thai regiment deployed to Vietnam, and as a staff officer with the 5th Special Forces. He graduated from Boston University in 1972 and is currently the western sales manager for CYRO Industries, a major chemical and plastics manufacturer. He lives in California with his loving wife, Susan, and has three sons, Tucker, Casan, and Quinn.